Have you ever wondered why your dog snores louder than your husband? It might be because of a condition named Brachycephalic Airway Syndrome. 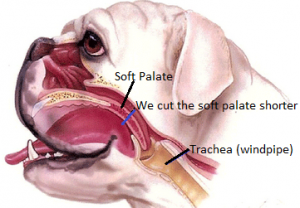 The disease refers to a set of upper airway problems that affects breeds with a short head and squashed up nose, most commonly pugs, boston terriers, pekingeses, pomeranians, shih tzus and bulldogs. Cat breeds such as Himalayans and Persians can be affected too. 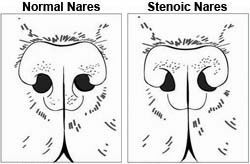 Stenotic Nares – This refers to narrowed nostrils which restricts the amount of air entering the nose. A hypoplastic trachea – this means that the trachea (windpipe) is narrower than it should be, lessening the amount of air that can reach the lungs. Everted Laryngeal saccules – the normal throat has 2 small pockets called saccules. When increased breathing effort is required, such as when the previous abnormalities exist, the pressure in the throat builds up and these saccules turn inside out and partially obstruct the back of the throat. 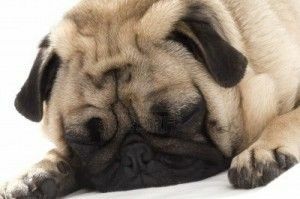 Signs that your animal might have brachycephalic airway syndrome include snorting, snoring, wheezing, gagging and collapse, especially during exercise or in humid weather. Because dogs and cats don’t sweat, their method of temperature control is panting and when airflow is compromised this is more difficult. Therefore, animals with this condition don’t tolerate hot weather, stress and exercise very well because a lot more effort needs to be exerted to move air in and out of the airways. This leads to inflammation and swelling of the airways resulting in further breathing difficulties and can become an emergency situation. Short term management options include weight loss, controlling exercise levels, avoiding hot weather, using a harness rather than a collar, avoiding stress and antiinflammatory medications. However, medical management will not correct the physical abnormalities causing the disease. At VetHQ we perform surgery to correct the breathing abnormalities. The younger the age the dog or cat is when we perform surgery, the better the prognosis for the future. 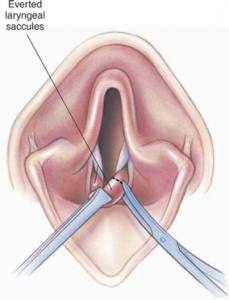 We remove the everted laryngeal saccules to widen the entry to the throat. 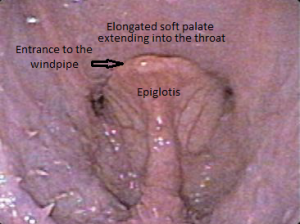 Unfortunately we cannot widen a narrowed windpipe but with the other surgical corrections, the improvement in airflow is so great that this abnormality rarely causes breathing problems. If you think your pet is suffering from any breathing difficulties, exercise intolerance, snoring or snorting, please make an appointment with one of our vets.